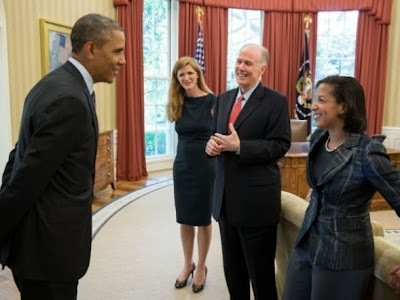 Barack Obama Samantha Power Tom Donilon and Susan Rice. Last week as we noted, the New York Times ran a devastating article about President Obama’s Syria policy. The Times reported, among other things, that the President was disinterested in planning discussions about Syria. Two other articles reported that America’s Middle East allies generally and the Saudis specifically were upset by the administration’s Middle East policy. Each Saturday morning in July and August, Susan E. Rice, President Obama’s new national security adviser, gathered half a dozen aides in her corner office in the White House to plot America’s future in the Middle East. The policy review, a kind of midcourse correction, has set the United States on a new heading in the world’s most turbulent region. At the United Nations last month, Mr. Obama laid out the priorities he has adopted as a result of the review. The United States, he declared, would focus on negotiating a nuclear deal with Iran, brokering peace between the Israelis and the Palestinians and mitigating the strife in Syria. Everything else would take a back seat. The blueprint drawn up on those summer weekends at the White House is a model of pragmatism — eschewing the use of force, except to respond to acts of aggression against the United States or its allies, disruption of oil supplies, terrorist networks or weapons of mass destruction. Tellingly, it does not designate the spread of democracy as a core interest. One of the problems with this description of President Obama’s evolution is that his own policies helped fuel the “sectarian violence” in Syria by doing nothing to help the rebels when it might have helped. His complete withdrawal from Iraq enabled the “extremism” of al Qaeda to once again flourish in the Middle East. His embrace of the Muslim Brotherhood helped bring about the “brutal repression” that eventual led Egypt to a second revolution. Of course, if Obama is doing it, it’s pragmatic. Then there are warning signs. Mr. Gordon took part in the Saturday sessions, along with two of Ms. Rice’s deputies, Antony J. Blinken and Benjamin J. Rhodes; the national security adviser to the vice president, Jake Sullivan; the president’s counterterrorism adviser, Lisa Monaco; a senior economic official, Caroline Atkinson; and a handful of others. It was a tight group that included no one outside the White House, a stark contrast to Mr. Obama’s Afghanistan review in 2009, which involved dozens of officials from the Pentagon, the State Department, and the Central Intelligence Agency. Ms. Rice said she briefed Secretary of State John Kerry and Secretary of Defense Chuck Hagel over weekly lunches. In other words, President Obama is only getting advice from those who think like him. But I think that this points up to another problem. Dr. Rice isn’t necessarily pursuing her own policy, she is doing exactly what the President wants. President Obama wants to be less involved in foreign policy and she is obliging him. The point of this article is to pretend that there was great considering put into this new approach. But there wasn’t. President Obama was always uncomfortable with foreign entanglements. Now he has the personnel to implement that strategy without question. If the New York Times is celebrating President Obama’s new isolationism, this approach is not at all popular at the Washington Post. In his zeal to extract his administration from what he sees as a regional quagmire, Obama, like the old freeze movement, has adopted a narrow and high-altitude approach to a complex and sprawling set of conflicts. Rising above the carnage in Syria — or “somebody else’s civil war,” as he called it in his recent speech at the United Nations — he has adopted a priority of destroying the country’s chemical weapons arsenal. He seeks to put stronger safeguards on Iran’s nuclear program while sidestepping its larger effort to use terrorism and proxy wars to become a regional hegemon. From a certain Washington point of view, Obama’s aims look worthy and, better yet, plausibly achievable — unlike, say, establishing democracy in Iraq. The problem with the approach is that it assumes that the Syrian civil war and other conflicts across the region pose no serious threat to what Obama calls “core U.S. interests,” and that they can be safely relegated to the nebulous realm of U.N. diplomacy and Geneva conferences, where Secretary of State John Kerry lives. Let’s suppose for the moment that al-Qaeda’s new base in eastern Syria, Hezbollah’s deployment of tens of thousands of missiles in Lebanon and the crumbling of the U.S.-fostered Iraqi political system pose no particular threat to America. That still leaves U.S. allies in the region — Israel, Saudi Arabia, Jordan and Turkey — marooned in a scary new world where their vital interests are no longer under U.S. protection. Diehl’s op-ed is such a direct rebuke to the New York Times article I wonder if he was aware that the Times article was about to be published. In other words the more “modest” approach can’t simply be achieved by wishing it. Mr. Kerry is certainly right about the severity of Syria’s humanitarian crisis. According to Valerie Amos, the United Nations’ humanitarian chief, some 2.5 million people are beyond the reach of aid, including 290,000 trapped in areas besieged by government forces. There are credible reports of children dying of starvation in the suburbs of Damascus, The Post’s Loveday Morris reported Sunday. Diseases are spreading, including scarlet fever. Yet to suppose that Russia or Iran would insist that the Syrian army meet “international standards” requires some very wishful thinking. It was Russia, after all, that prevented the U.N. Security Council from adopting a binding resolution ordering the regime to allow humanitarian access this month — a fact that Mr. Assad’s henchmen have cited as they have denied visas to relief workers and held up convoys at borders and checkpoints. Russian President Vladimir Putin himself inflicted a similar humanitarian catastrophe on part of his country, Chechnya, a decade ago, using similar tactics. As for Iran, its military commanders and proxy militia Hezbollah are directing or conducting the same sieges that Mr. Kerry wants lifted. Reading about the chemical weapons inspections in Syria or nuclear negotiations with Iran you see this. The reporting on the inspections in Syria is muddled. What really are the deadlines for the regime. All chemical weapons sites were to be visited by October 27 and all weapon production capabilities are supposed to be destroyed by November 1. However inspectors can’t get to two facilities due to fighting in the area. I think it can be assumed that the equipment at those facilities will not be destroyed by the deadline, yet Syria is in no danger of suffering any consequences. Some priorities were clear. The election of Hassan Rouhani as president of Iran presents the West with perhaps its last good chance to curb its nuclear program. Mr. Rouhani has a mandate to ease sanctions on Iran and has signaled an eagerness to negotiate. Note what it doesn’t say. It doesn’t say that Rouhani has a mandate to slow, stop or roll back Iran’s nuclear program. But I think this reflect the administration’s thinking (and the New York Times’s thinking) that a deal has a value in itself even if it doesn’t accomplish anything. Leverage is useless if you aren’t willing to use it. The Obama administration’s foreign policy has descended into wishful thinking instead of any strategic thinking. The New York Times is there cheering it on. Technorati Tag: Obama and Iran and Syria and Egypt.